Gold & Adventure goldpanning school. (Kopparberg, Sweden). And you keep all you found. Time approx. 3 hours and price 200sek for adults, 150sek for children up to age of 12 years. This homepage is mobile. Just type www.goldsucher.de into the browser of your internet-enabled smartphone, iPhones, and you’re connected to the mobile version, the website for gold prospectors and gold panners. 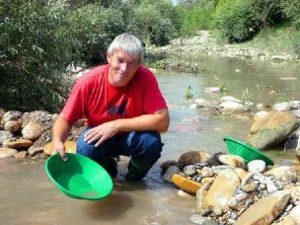 The mobile version automatically adapts to your mobile phone; it offers tips and up-to-date information about gold panning. So you are informed everywhere – even when washing gold on the riverbank or on holiday. Network connection required. From the earliest times, men and women have searched for gold, one of the world’s most precious metals. Its scarcity means that if you find it, you have found something of beauty and of great value too. 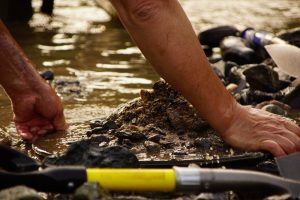 Gold can be found in many areas of Scotland and particularly in the Lowther Hills around Wanlockhead and Leadhills where gold panning has been popular for centuries.